Stephen Clarke, Research and Policy Analyst at the Resolution Foundation has just produced a report that adresses this topic. It is fascinating as it blasts away at some of the stereotypes about millennials – those born in the 1980s and 1990s. This is the digital generation who supposedly are turned off the idea of a job for life. Instead they are attracted by portfolio careers as that pattern fits more into their desires for travel and for being self employed. And this age group are travelling abroad more than they’ve ever done and there has been a dramatic rise in self-employment since the financial crisis. “However, far from being footloose and fancy free, when it comes to work, millennials are far less mobile than the previous generation. In fact young people – particularly young graduates – are moving jobs, and moving around the country, far less than they used to. By moving for work less frequently than in the past, today’s young graduates are missing out on significant pay rises. 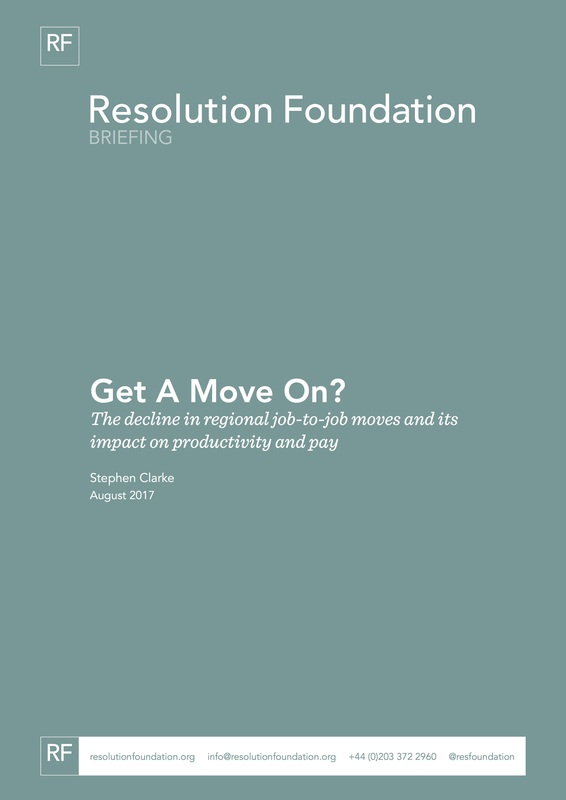 The typical annual pay rise for someone changing jobs but remaining in their existing region is over five times higher than that achieved by someone who remains with the same employer. Those who additionally move region receive even higher rewards. So what can be done? Stephen argues strongly that part of the solution is to remove any barriers that may prevent young people moving to where there are jobs that better suit their talents. A lack of quality affordable housing can stop people moving and makes it hard for firms to find the best staff. Similarly in many parts of the country poor infrastructure makes it incredibly difficult for people to commute long distances; investing in roads, railways and bus routes would help. Tackling the housing crisis, significantly boosting infrastructure spending and tackling regional inequalities will take time. He implores policy makers to recognise that today’s young people are – in many respects – similar to previous generations. His research suggests that they do value job security and expect their earnings and living standards to improve as those of older cohorts have done. Where they are different is that, for many reasons, fewer are moving jobs, relocating and earning pay rises. But I would argue that many of them are also looking at work and careers differently simply because work and careers are so different now. We have interviewed many millenials over the years and the Middlesex University research study that we quote in our book does indeed suggest that millennials – along with the over 60’s – do find the notion of portfolio careers very attractive. It will be interesting to see if the lack of job mobility does actually motivate this generation to look for the broader attractions of portfolio careers and portfolio living at different life stages.